First up, what is presumably a temporary diversion for National Cycle Network 1 down in Kent, near Rainham. This anonymous and useless beauty was pinned up and pointing, I kid you not, right for the centre of a roundabout with three exits (where Otterham Quay Lane meets Lower Rainham Road specifically). No further instructions... lovely! Surely the general principle with roundabouts is that you sign the exits, not the entry?!! 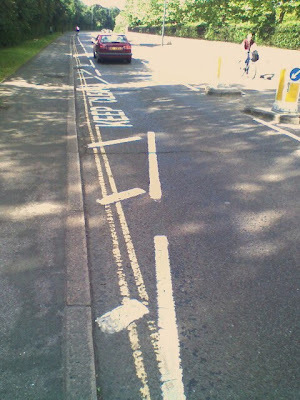 Next up, some superb and safe marking down in Barnes in South West London. Some clever planner has decided that at every stretch of Lonsdale Road where there is a lowering of the pavement (for wheelchair access etc), they will suddenly ditch the marked cycle lane and feed cyclists out into the middle of the road. In my photo, there is an island in the middle, but they have implemented this even where there is absolutely no reason for people to cross - with high fences along the side of the road. Surely the danger of a pedestrian stepping in front of a cyclist (which London cyclists are fairly used to, particularly on Bishopsgate) is vastly outweighed by the danger of cyclists swerving into cars every 30 yards along the road, or skidding in the wet on the heavy raised white paint if they decided to ride straight over the markings. Not at all clever.. Finally, one of amusement rather than any particular angst - the red box at the bottom of the sign has been added to this sign... why?! 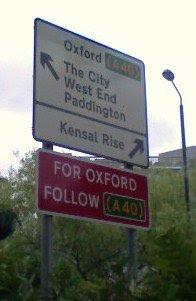 For Oxford, follow the A40.. As opposed to the top, which says.. Oxford... A40? Finally a query? I'm very keen on bicycle routes, and clearly Sustrans are doing a great job overall, particularly in securing funding to implement routes. 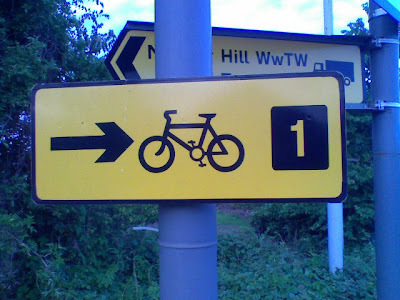 They've even started writing words on cycle route signposts rather than just numbers - fantastic improvement. Question though - if, say, I want to see a map of a cycle route - take NCN6, which allegedly runs from Reading to Bangor or somewhere... how do I do it? 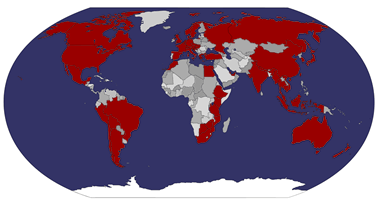 There's the overall cycle route map of the whole country, which is a good guide but no use for detailed planning whatsoever - even huge cities like London and Birmingham are represented as points. If you google NCN6, you might find individual councils making reference to little bits of it in their neck of the woods. But what about the whole route? Where is NCN6? How do I use it? Do I just cycle to Reading and look about, hoping for the best? Why is there not a downloadable guide to each route, or map overlay? Give me Google Maps overlays! Am I missing something here?